Before I begin I would like to thank everyone for all of the positive comments that you left for DinoBoy on his guest post yesterday. It has inspired him to start his own blog! That and the fact that the lovely @eburypublishing have sent him some more books to review. In my absence he is reading and as soon as I get home we will create his site. That is so exciting. He will at the very least have something to show his teachers when he goes back to school in September and at the highest level. Who knows? The sky is his limit! !So here I am one day into my American adventure. I don't know why it is but whenever I fly anywhere it always involves me getting up at stupid o'clock and today was no exception. The only difference was that by the time I left the house and hour later both of the girls were awake. FunnyGirl came into my bedroom still half asleep with tears streaming down her face. "I don't want you to go mummy - I need you..."
I had to really hold it together not to loose it myself, picked her up and gave her the biggest cuddle in return for one of her special soft kisses that she keeps just for me and took her back to bed with promises of an American bammy (she collects pandas) - still sobbing, a bag full of tat from the $ store - still tears and a big bar of chocolate - bingo. As I came out of her room ModelGirl's door opened. Last night she had very kindly entrusted me with her prized cuddly bunny and one of her snuggy's. (The said bunny I gave to her for her very first Christmas and that was what started her whole bunny thing) Anyway she didn't want me to be on my own and thought that Manky bunny (as he is fondly known) would be able to keep me company. To be fair he looks to me like he has his mind on other things but hey - who am I to judge? It's his first time in the US. She told me and Manky to have a lovely time, gave me a lovely cuddle and went back to sleep. So I escaped whilst I had the chance. After an emotional farewell to my Mr off I set. My journey took me from home to Birmingham airport. From there to Philli and then on to Chicago. All things considered not a bad day's travel. Oddly, it is the first time in my life that I have ever travelled in that direction - our family destination of choice being Thailand is totally the other way. So going backwards through time feels bit odd and only something that DinoBoy understood in our phone check in. Her I am then in Chicago - it looks slightly odd to every British person I would think. It looks all very new - like Milton Keynes or Telford but with the tallest buildings that you have ever seen - that and a lovely river view that to be fair is not to be had absolutely anywhere in Telford or Milton Keynes. I'm glad you got to Chicago safely, yay for you holding it together when you were leaving, I would have been a blubbering mess! And wow wee to Mr for using all his Amex points! I bet your hotel room is Stupendous! Let us all know how the Blogher event goes? 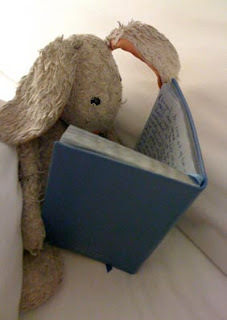 Sounds like you were very brave leaving them all, sooooo lovely that she gave you bunny to take with you. Im jealous of the chance to go and wander around the shops in peace. Ive never been to the USA and I never get to go shopping alone! My Hubby used his amex points to buy us both a bike! Will have to give him some pointers for next time I think! Manky bunny looks very like my dh's puppy- ie rather threadbare! Very sweet though and a lovely reminder of home. Glad to hear dinoboy has been inspired. I wrote him quite a long comment and managed, idiot that I am to delete it when I tried to post it! Have a great time, I am looking forward to your next instalment! Oh so exciting. I would love to be there, hope you have an amazing time, cannot wait to hear about the rest of your adventure.